The OGL is a new licence introduced by the new UK government to open up public data. Supposedly tax-payer-funded products of the government are supposed to be released back to the public as a commons resource. "free as in free speech not free as in free beer"
ITIL is currently entangled in contractual and licensing constraints that led the UK's Office of Public Sector Information to remark " ...this begs the question as to why [OGC] sponsors the publication of proprietary IT service management guides"
The OGC has already collected royalties on a million certifications, hundreds of thousands (millions?) of books, and many trademark licences and product certifications. I think it is safe to say they have covered costs. Besides setting ITIL free doesn't mean making it free. People will still buy the books, just not because they have to, not as often, and not at monopolistic prices. Vendors will still certify their products, companies will still use accredited trainers, and another million people will be certified. We think ITIL content should be open content available for reuse in the same way that the similar Microsoft Operating Framework is already (it uses the Creative Commons licence). OGC would retain control of the ITIL trademark, protecting the brand (which must be acknowledged every time the open content is used). We think this should not constrain trainers from providing un-accredited training about ITIL (let the buyer decide if accreditation is important), consultants from using ITIL in their own products (thereby further promoting usage and sales of ITIL), and authors from adding value to the ITIL body of knowledge. By opening up ITIL, Her Majesty's Government will make a major contribution to the IT industry worldwide, will entrench ITIL's preeminent position, and will encourage the community to willingly contribute volunteer content and labour to OGC's products into the future. Please, free ITIL®. Someone has to govern the ITIL brand to keep all users honest. But they should be free to use it honestly. Not convinced? Here's more on why this is a good idea. Submitted by skeptic on Thu, 2011-02-10 21:55. The Government policy is to use Open Standards. Two Government owned standards are not open: it is purely commercial. PRINCE2 and ITIL. The ITIL standard costs £295 for the set and is NOT freely available as pdf. Civil servants must pay this to get the set which is very uneconomic. Re-users are charges up to 20% royalty: even PhD students have received demands for licensing and payments regarding this standard. Licensing can take up to 6 months. This is surprising given the Government policy of open standards: if this principle is not applied to Crown Copyright material produced by Civil Servants how can you expect industry to comply? The UK Gov’t programme is currently advocating the use of ITIL as a standard for the Cloud programme: however as it is not open for free re-use how does this reflect the Government’s policy here? Please can you confirm whether or not Government’s own material that is a central standard used in roll out of the cloud programme will or will not be made Open Source? Submitted by Visitor (not verified) on Thu, 2011-02-24 09:24. Submitted by skeptic on Wed, 2011-01-26 18:18. 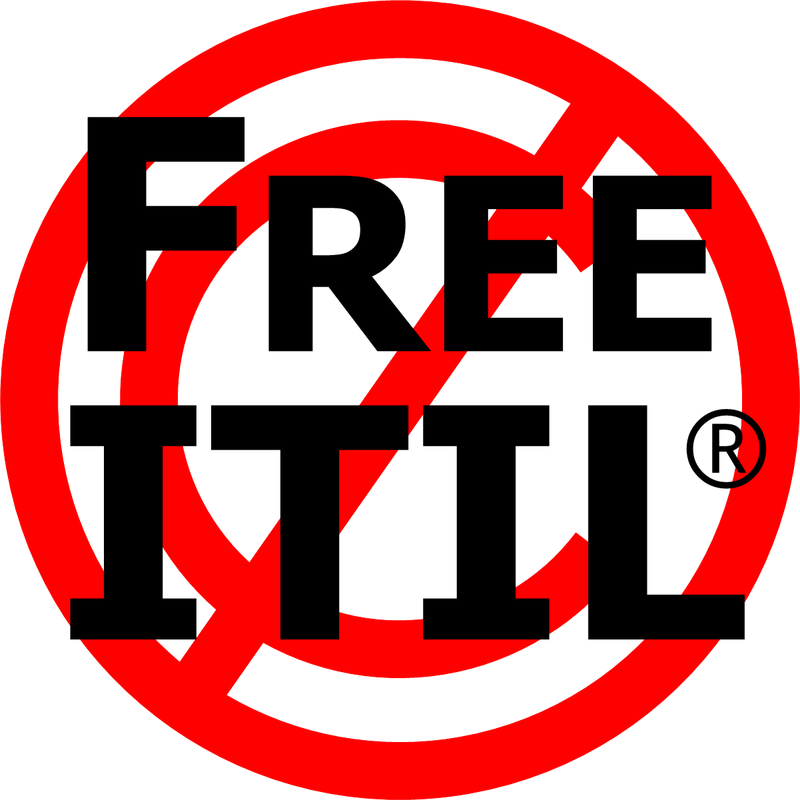 The "Free ITIL" logo is of course NOT copyright or trademark or anything (other than OGC's trademark over the word "ITIL" which we honour deeply and respect to the ends of the earth). So please feel free to put it on your websites with a link to this page as a gesture of support. Petitions only work if we get lots of people. Submitted by Steven M (not verified) on Mon, 2011-02-21 21:38. Submitted by skeptic on Tue, 2011-02-22 09:34. Submitted by Oleg_S on Fri, 2011-01-28 14:33. Submitted by avallesalas on Wed, 2011-01-26 21:56.